I consistently have this same problem with FF3. I don’t get how their footprint has gotten so out of control since v1, it was amazing back then! Sometimes it’s good, sometimes it’s bad and you never really know. Right now I have 9 tabs open at 90M. I typically have to restart FF3 a couple of times a day which is worse than FF2 was. Sorry, but that would be 16.777 exabytes not terabytes (i.e., 16,777,215 terabytes =~ 16,777 petabytes =~ 16.777 exabytes). 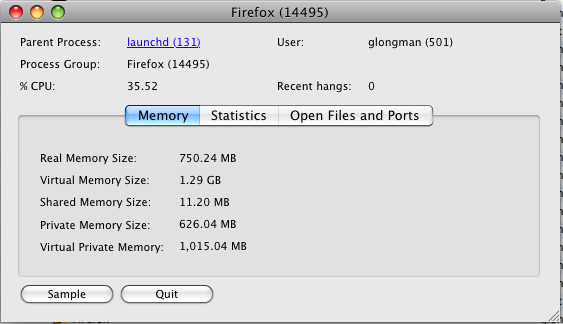 this is not a FF problem, it happens when many applications aquire over 2GBof RAM. I experience it in Photoshop CS3 on Mac os x 10.4.11, others have the same in Illustrator others with music software, others with Databases e.t.c. I have no solution for it though.